iPhone can connect to anything! Update: This was an April Fool’s day joke. So I ordered one and set it up. The accident that unlocked all this is that I was getting up out of my desk chair while reading on my iPhone. The chair bumped me and I dropped the iPhone from a couple feet up. By some weird chance, it landed in the docking station. Not only did it fit perfectly, but a hard drive picture appeared on the iPhone’s screen. Just a few seconds later, my Windows XP computer recognized the iPhone as an external hard drive! 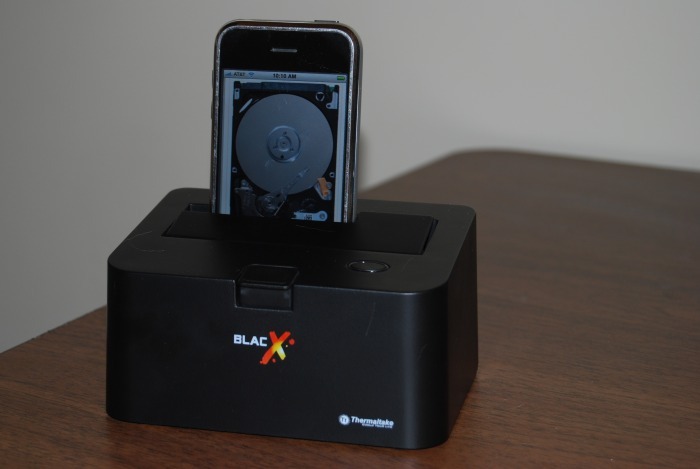 I pulled the iPhone out and was able to reproduce it by pushing the iPhone down hard into the docking station. Dropping it from couple feet the first time forced it into the connector, and it does take a little more muscle to make the connectors mesh than I’m used to with peripherals. 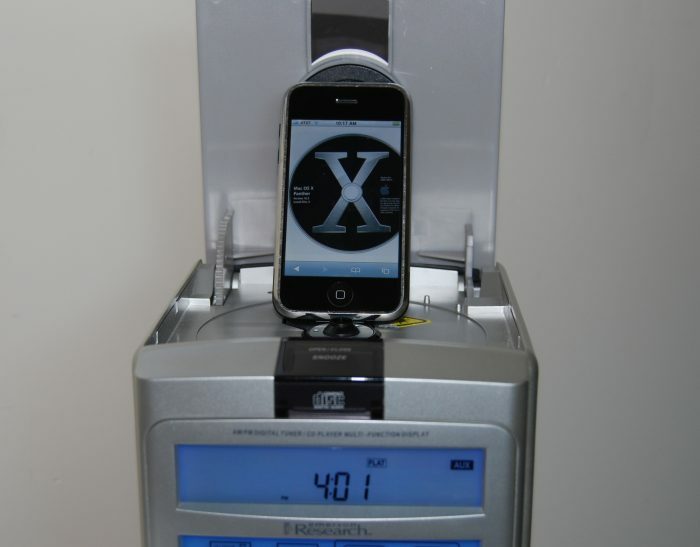 The iPhone is formatted with HFS+. I happened to have drivers for HFS installed on XP; the default installation of Windows doesn’t have these drivers, but you can download hfsutils here. 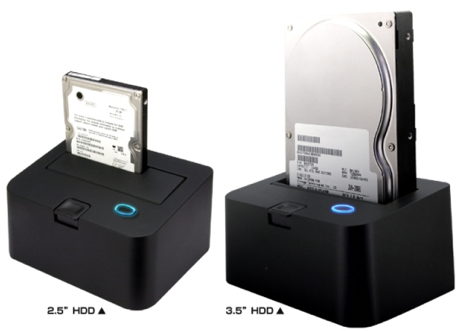 If you have hfsutils installed, the iPhone looks like a regular hard drive. I’ve been able to backup my iPhone and restore the image to my wife’s iPhone with no problems (she still keeps her phone number of course). I’m not an expert iPhone hacker, even though I know a few things, so it’s been slow-going. But I’m making solid progress and wanted to alert other people that the iPhone works in this way. I’ve tried a few other external SATA enclosures, but I’ve had best results with the Thermaltake so far. Is anyone else seeing this behavior with their iPhone? To my surprise, a CD-ROM image appeared on the iPhone. Sure enough, the CD player started playing my iPhone! Of course, it was a data CD, so instead of music I got an awful racket as the CD player tried to play the data CD on the iPhone. A few seconds later, the lock clicked and the door swung open. 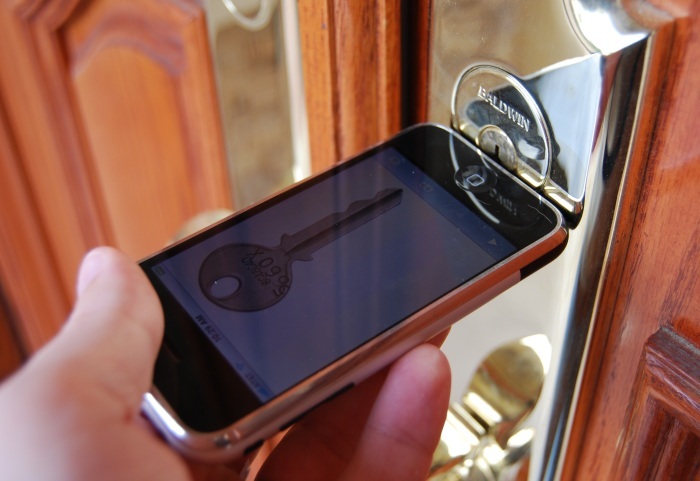 So far, every lock that I’ve tried with my iPhone has opened, even the industrial-strength ones. It worked really well, but in my enthusiasm I somehow buttered my iPhone and ate it in just a few bites. 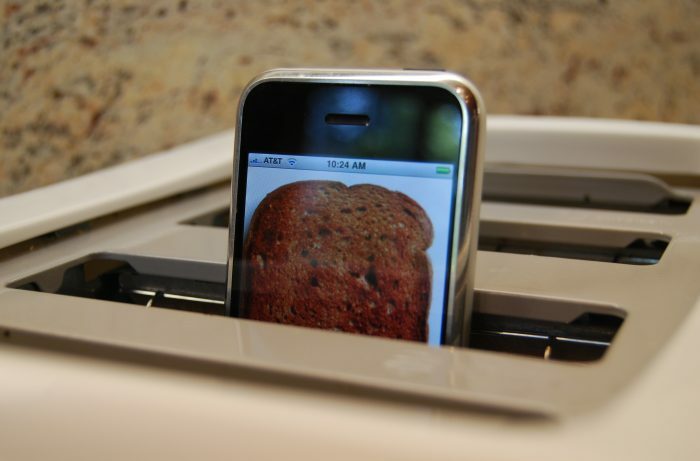 On one hand, the iPhone makes for a really expensive piece of toast. On the other hand, it was delicious. So that’s it — my iPhone is gone now. 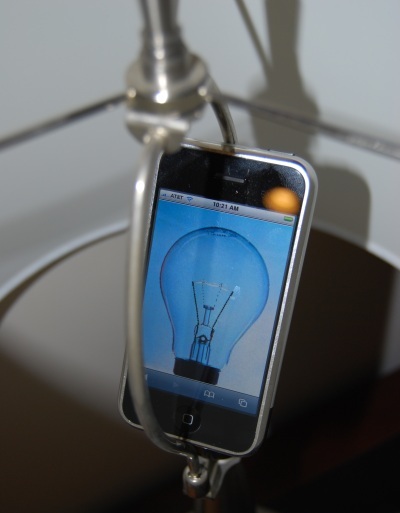 So I’m going to ask: has anyone else done similar experiments with their iPhone? Where you can stick your iPhone and what happened? Lol, sales of Thermaltake go up, really Matt going to need better than that to fool anyone =) But i think its to take away the attention from your “tattoo”, anyway good tries 🙂 didnt get me though. Does the needle actually move when it’s being accessed?! Yup Brian White, you can watch it scan. As far as I can tell, it’s not a physically accurate rendering though. There are five different images and it just swaps to whatever image is the closest to correct. Ha, ha. Good one. We’re not buying it. That hard disk picture was photoshopped onto the iPhone. Wow, you’re really good with Photoshop! (heh) This is what happens when you don’t do an official April Fools’ post. I’d be really worried about viruses . . . there’s no antivirus on Iphone as far as I know. . .
oh man, I’m getting an iphone for sure now! I’m always needing more lightbulbs! I can confirm all except the CD player as I don’t own one of those since, you know, I have an iPhone. Try holding it next to your electric shaver…this thing cuts so close and leaves you feeling SO smooth! Thanks Matt for the amazing tip, I can’t believe we never realized this before. May 4/1/08 live in infamy. That’s googley. Our iPhone makes Kentucky bourbon. Wow!!! Apple beats Microsoft this time. I wonder what Microsoft will come up now. Oh by the way, I tried the iPhone in an ATM machine and it allowed me to withdraw funds from somebody else’s account. After plugging it into the ATM slot, the ATM screen started showing the Apple logo and listed all the accounts available for withdraw. You have redeemed yourself. This post I liked, and yes, I almost thought it was possible until the CD player image. just one word “too much” oohh thats two words!! hehe, as long as i win:) do i get an iphone? You gave yourself some trouble to put up this prank. I suppose one tangent here is how long will it be before Apple comes out with something like this? Ultimately one assumes that if the current rate of technological advancement is maintained it won’t be long before even basic appliances have some kind of central CPU that may well present an interface option to AOG (Any Other Gadget). Lost your TV remote control? Try your toaster instead; sure, you can only move between a handful of channels but it’s better than being stuck on C-SPAN. Thats great, versatile and the perfect size. I wonder if it’s able to crash a CD player as gracefully as it crashes itself? The toast one is the best. Laurent and Emmanuel, glad you like it. If anyone wants to post their own photos, it’s pretty easy to do. 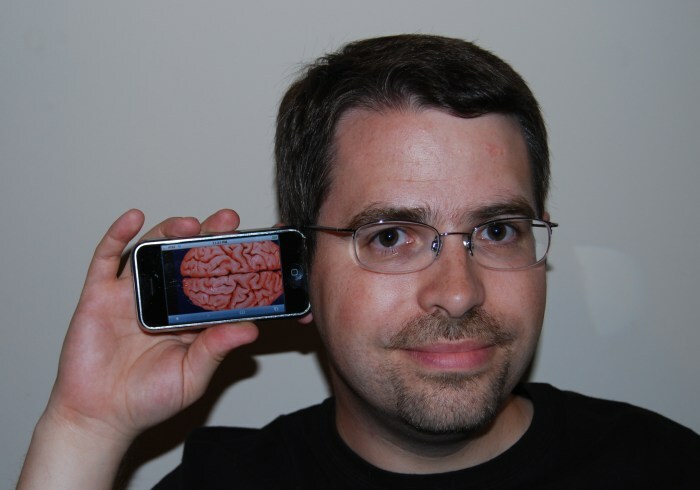 Just do an image search for something fun like a brain (as if the iPhone were going to be a brain augmentation device for example), pick a good photo and zoom in on it, then position your iPhone for a photograph. 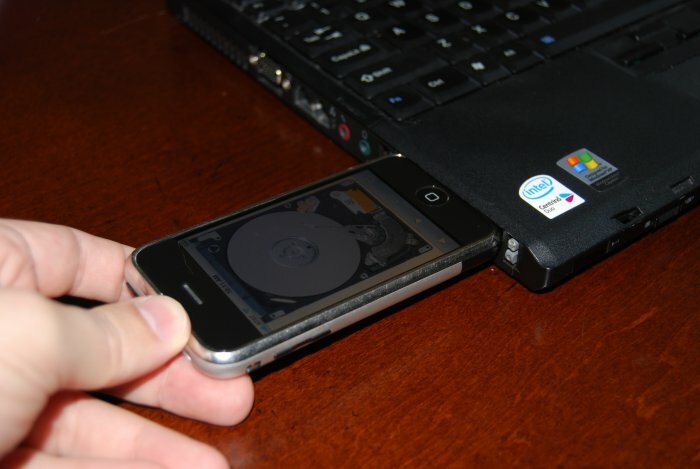 Can this work on the iphone touch[ just the mp3 player, that looks like a iphone cellphone]? i tried it with my iphone and (of corse) it didn’t work. but it make some good pics for my tv show. I’m getting an iPhone soon. I’m going to try and unlock and start my car with it!